Amazing blue skies in November! We’re feeling a great sense of satisfaction that the double pitch roof to the garage and the triple pitch roof to the utility room are fully slated, with the newly sourced ridge tiles sitting proudly on top and the verges all pointed up In all my years working on renovations and doing DIY, I’d never attempted roofing before but budget constraints meant me & he had to get stuck in. I’m so SO chuffed we did, I can’t tell you how much satisfaction we’re both getting looking at the parts finished already. There’s a helluva way to go yet, with the West Wing roof and four dormers, never mind the main house but it’s a start eh? 🙂 It was a bit of a baptism of roofing fire with this complicated area of valleys and pitches above the utility, but with Stan on hand to give some advice & a helping hand, we’re nailing it. Literally. 5 pitches down, 11 to go! I was given some advice via Twitter which made absolute sense to me. 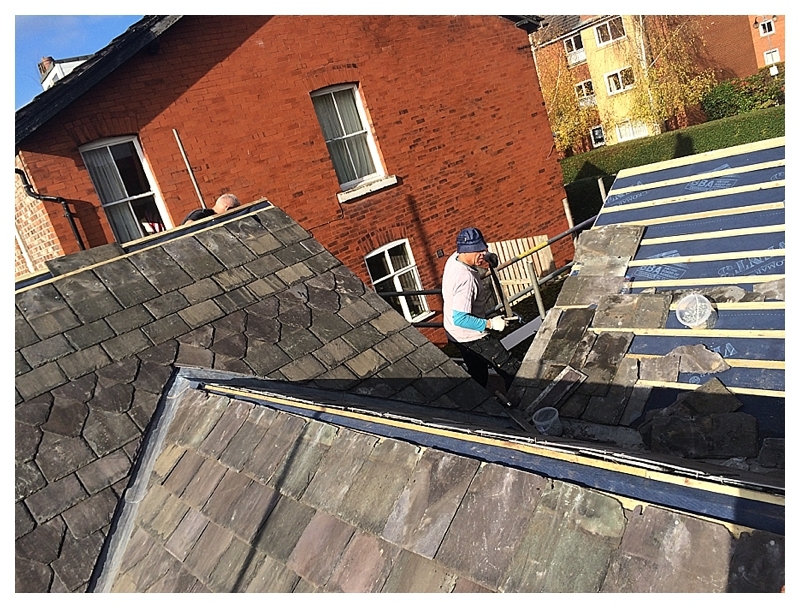 We’ve created a new but traditional roof using reclaimed slates and also reclaimed ridge tiles which can’t therefore be screwed or mechanically fixed on like new ones, but must be bedded down with mortar. Also at the edge verges I don’t want a modern plastic ‘dry verge’ but traditional mortar pointing. However, one of the problems with mortar, whether sand & cement or lime based, is that it’s rigid and inflexible so can crack easily, plus over time it weathers and eventually disintegrates. 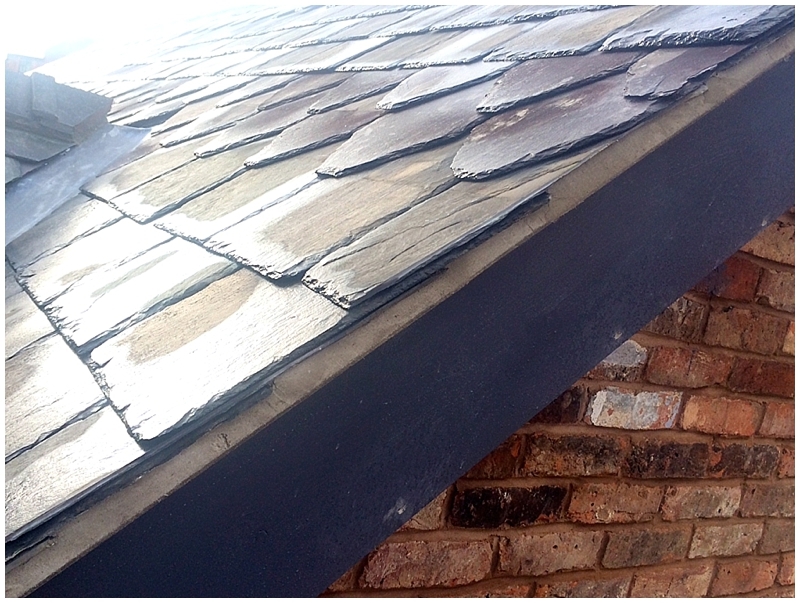 The ridge tiles become loose and can slip off, plus wind and rain get in through cracks and gaps, potentially causing leaks and also heat loss. I wanted to try my best to avoid the sort of problems you can see below and which you can see on older traditional roofs everywhere. Ridge tile and verge pointing cracking and falling out. Images from Google. Step in Chembond, recommended by a self builder contact. 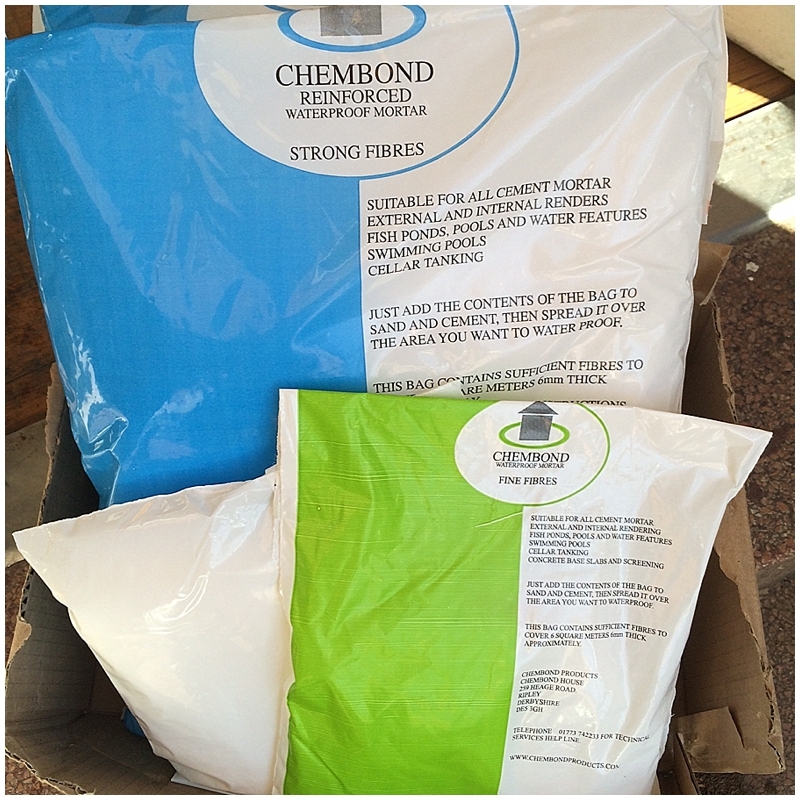 They import polypropylene fibres which get added to mortar or render mixes to make them super strong. My Twitter pal had added some to his 3:1 mortar mix when bedding ridge tiles and pointing verges. On areas where the builder hadn’t bothered, the mortar has cracked out, but his fibre mix was holding firm. Now I know this isn’t a lab comparable experiment but at £30 or so for the fibres we needed, I thought it was worth a go. Trish and Jeff couldn’t have been more helpful on the phone answering all my questions and the technical info sent was great too. Mostly these fibres are added into render mixes to prevent cracks across rendered surfaces and they claim to create the strongest renders in the UK no less. You can also add them to screed and to waterproofing mixtures for fish ponds etc. When I asked local builders & roofers merchants about them they’d never heard of them but you know what, every builder and roofer I know has had to repoint roofs so that tells you something doesn’t it? The fibres are added to wet sand in the cement mixer and allowed to disperse before the cement is added. Mr M said they were easy to use and was amused as they crackled in the mixer like Rice Crispies 🙂 The instructions said be careful not to over water but they didn’t make it hard to work with or anything like that, if anything the mix seemed a bit soggier than a usual 3:1. I pointed up some of the verges, see below, and it was very workable. 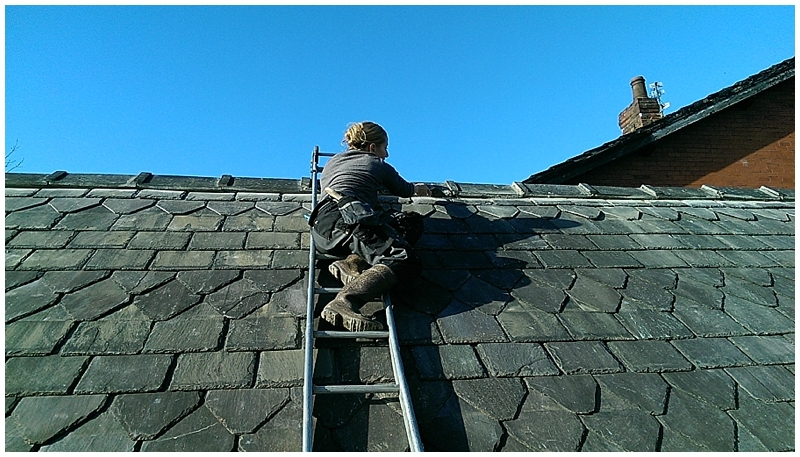 Nice day to clean up my ridge tiles! After a few hours I scraped off the excess and used a plastic washing up brush to scrub the slates and ridges clean. Don ‘t do this whilst the mortar is still wet or you’ll ruin it, test it first. 3 steps to my ridge tile pointing being all nice and clean! Good idea with the fibres Sian, I know NHBC have spent significantly on roofing claims following the harsh winters we had a couple of years back. 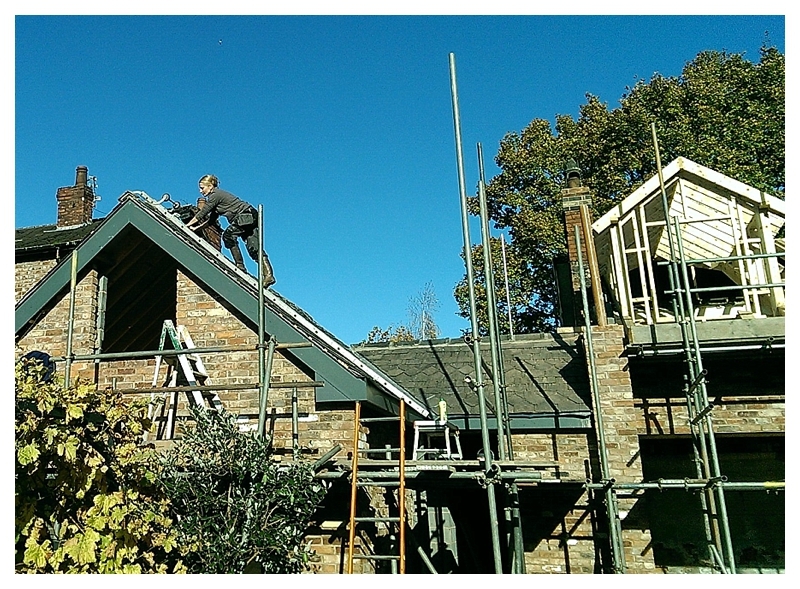 Roofers pinching brickies mortar (too weak) being part of the issue. Need to sort my ridge tiles next year and will remember this, was thinking of also using a liquabond bonding agent we use with renders for tanking systems. Ha, never thought of the nicking mortar possibility but makes sense. We’ve used a 3:1 using grey sand not red building sand, with these fibres added, seems rock hard but without being brittle, time will tell though eh. The guy that recommended them to me was very enthusiastic about performance, always a good sign. They do a fibre specially designed for tanking renders too, check it out? Hi Sian, NHBC publish guidance on the issues they are spending on, might be of interest with your roofing hat on! They spent £11m on it in 2010. Will have a look at those fibres, we do use them in forming concrete to falls over external decks, which then receive tanking.